Grey Reef Western Wingshooting 2017 season is almost here and man I’m excited to get things started! Spring rains here in 2017 have continued well into June, what does this mean? 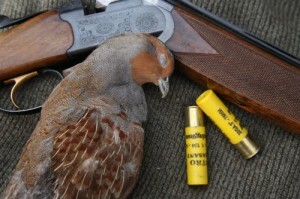 Hungarian Partridge broods should be doing quite well, in my experience I expect a robust return of large coveys of 20 plus birds and back to what we witnessed two years ago with a bumper crop of Huns! A quick note we have just a couple slots left to fill in our Sage Grouse Season, the season dates are Sept. 16-30. 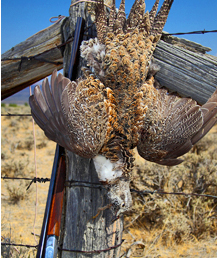 If you want a very unique hunt for Sage Grouse combined with Blue Grouse & Hungarian Partridge during those dates get with us soon, they wont last! For those of you who don’t know we have over 30 square miles of Private Ranch land leased exclusively for bird hunting, its a real hunting paradise, client dogs are welcome and we have kennel space at our lodge for them or just hunt over our guides dogs, your choice. Call Judi or Jason at 307-267-2559 and get booked today! 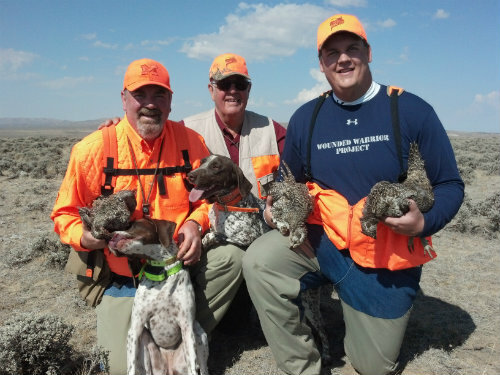 Wyoming Sage Grouse Hunt dates available for 2016, dates open are Sept. 17,18,19,24,27,28…This wild bird hunt can be combined with Huns and or Blue Grouse and Chukar. We have some slots open in October for Huns, Chukar, Sharptails, and Blues…give us a call for available dates, come hunt and stay in our brand new lodge just opened, see our lodging page for details. November is my favorite month of the fall for both bird hunting and catching big brown trout, Cast and Blast trips available, weather is typically not a big concern until around Thanksgiving here in Casper. 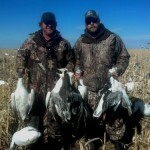 Dont take my word for it come check out our great hunting in November, you’ll love it! Call Judi or Jason at 307-267-2559 for booking. 7/21/14 The 2014 Fall Crop of Upland Birds looks great! I have been guiding birds in this area for 12 years, lived in Wyoming my entire life, this is the best the prairie grass has ever looked. Timely rains and the perfect amount of sunshine has grown prairie grasses as tall as my knee. This has translated to many upland birds including Hungarian Partridge and Sage Grouse with the perfect balance of food and water, the cover should allow the young birds good overhead cover to avoid raptors…we don’t know yet if the birds will be as plentiful as in 2011 but things are looking real good! 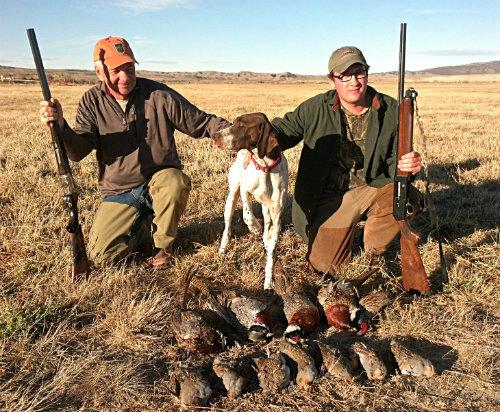 The very best time to enjoy our hunting in my opinion is November, the weather is perfect for hunting, a lot of days in the mid 50′s and as we get cooler weather the birds tend to start to group up into bigger covey sizes…for availability and booking call 307-267-2559. 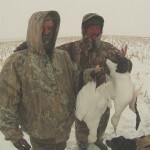 Weather Stalls Migration, 1.5million snows! 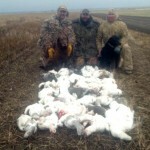 3/4/14 We are hunting the snow line and the snow goose roost that we are hunting now holds over 1/2million snow geese according to local biologists, another 750,000+ in the area, thats 1.5million snows in our hunt area. The massive roost can be heard in the mornings from over 5 miles away, quite impressive. Hunting has been up and down which pretty much sums up snow goose hunting as a whole. Our guides are enjoying some morning shoots that have guys ripping through shot shells as fast as they can reload, other shoots are leaving us feeling schooled by a bird with a brain the size of a walnut. 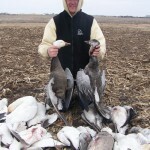 Never the less we are absolutely having a fantastic spring snow goose season, the spread we are running is complete with 1200 sillo decoys, 120 full bodies, 6 vortex machines and about 50 flying flapper decoys, take all that and add in two sound systems and 8 speakers and you have a recipe for success. Give Jason or Judi a call 307-267-2559 book your trip today.